In October 1941 a small Albanian communist group, established in Tirana, was being lead by Enver Hoxha and an eleven-man committee. The party had little appeal until 1942 when Albania's youth joined in mass to liberate Albania from Fascist Italian occupation. In November 1944 Enver Hoxha's new communist government took immediate, forceful measures for total power. In January 1945, a special court was set up in Tirana for trying war criminals and sentencing many to death or long imprisonment. Months later private property was confiscated, industry was nationalized, and communist propaganda hardened it's grip. By June 1948 Albania sought Soviet ideals and Albania’s alliance with the Soviet Union brought several advantages. The Soviets offered food staples, economic assistance, and military protection from "Western powers" and neighboring Yugoslavia. By 1955, newly isolated Albania had become the epitome of a Stalinist state with Soviet models being copied or adapted for virtually every sphere of Albanian life. As the early 1960s arrived, Albania was no longer an interest of the Soviet Union and diplomatic ties with Enver Hoxha's Albania were cut. This then lead Albania to look for aid and The People’s Republic of China provided Albania with open arms. Industrial goods flowed into the country, low-interest loans, and surprisingly the Cultural Revolution that China was experiencing; Albanian writers and intellectuals were harshly pressured to follow Albanian communist ideals. 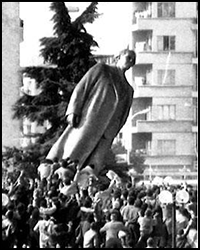 From 1966 to 1967 Albania experienced a Chinese-style cultural revolution. Administrative workers were suddenly transferred to remote areas and younger cadres were placed in leading positions. The collectivization of agriculture was completed and organized religion banned. As the decade passed on into the 1970s and beyond, Enver Hoxha's leadership greatly isolated the country, grew more dark in operations, and fell out of favor with the people. 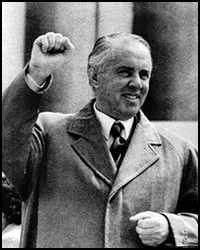 On April 11th,1985 the heavy handed Enver Hoxha died and his successor Ramiz Alia of Shkodra does little to change policy. This leads to the bedrock of the Communist system to falter and in the summer of 1990 thousands of young Albanians risked their lives to seek political asylum in the French, German, and Italian embassies in Tirana. With Albanian life now rapidly changing, multi-party elections were held on March 31,1991 and parties quickly did their best to illustrate the economic, political, and social backwardness of the Albanian Communist Party. With the fall of communism so recent and so many ex-communist participants alive, Albania is full of "old wounds". Many Albanians live impoverished lives wishing to reclaim businesses, land, and social fabrics once enjoyed. During communism, Hoxha created several small prisons inside larger ones. Alleged enemies of the state were sent to prison camps, modeled on Stalin’s gulags, and were forced to work government mining and construction projects. The prison death rate was said to be appalling. Former Albanian president Ramiz Alia quoted on lost documents of victims: "I am sorry and I consider it a bad thing that there have been people who have become victims of our carelessness, our severe actions, or... the mistakes or our institutions, like the secret police."